Patty at Reasons for Chocolate bestowed this award on me last week. I'm finally getting around to acknowledging it due to not being on my usual computer. Patty is another Catholic mom who just happens to be from a large family. If you get a chance, go visit and look around her blog. She's a really busy mom, and she's pretty cool, too! 1. Thank the person who gave you the award...Thanks a bunch, Patty! I cry during some commercials. I can't stand to see misspelled words, specifically when people use "loose" for "lose" and "too" for "to". People ending sentences with prepositions are also a major pet peeve! Really. You don't have to add "at" when asking, "Where are you?" I've never had my hair longer than shoulder-length. I had my first pedicure at the beginning of the summer...and will get my second in a few days. I yell at sporting events...even if I don't fully understand the game...even if I'm watching it on tv. Thanks again, Patty! 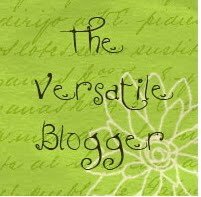 I hope everybody will have time to visit these awesome blogs! Congratulations. I yell at the TV too and cry at some commercials. Aaw, thanks for thinking of me! What I like about the blogger awards are the lists of awesome bloggers that are highlighted...ones I wouldn't know existed unless someone spoke of them. Thanks for sharing all those blogs! cong. on your award. The only commercial that makes me sad deals with the animals in shelters. Is there a specific commercial?have a good Sunday. Hi Mary! Congrats on your award! One Tv commercial that I just can't watch because it tears my heart out is the one about abandoned dogs and cats where they play Sarah McGlaughlin's *sp* "In the Arms of the Angels". Oh my word!!! what a tear-jerker of a commercial! AND I don't necessarily yell at the TV but I do make comments, like at America's Got Talent and when they passed some of the dumbest, craziest acts through and sent really talented people home! Oh my word!!! Oh Mary, you are SO KIND!!!!!! Muah!!!! Just so you know, misspelled words drive me crazy too! So do grammatical errors, which I try desperately to catch before I post each day. You know, I meant to type that I cry during Extreme Home Makeover...not Home Improvement...ugh! @ Patty: I knew what you meant! I've had to steer clear of that show...I get way too emotionally attached to the families in that short amount of time!